A steaming bowl of ramen, gyoza, and an ice cold local craft brew...Mondays just can't get any better than that. And at Yumi, you can enjoy a double take of ramen every Monday, with Yumi's Ramen Mondays...now how cool is that? It's that simple. Choose your favorite Eagle Scout Cookie, pair it with one of Scout's Honor's flavored artisan Craft Milk, and blend it together with one of their unique ice cream creations. Your very own milk shake designed to your exact specs and served in a cool mason jar, in just a few minutes. Scout's Honor's Chef Miko Aspiras brews up another playful and inventive dessert creation using his signature line of cookies, and just in time for summer too. The blend of distinct flavors, from sour, sweet, salty, bitter, and spicy notes, weave seamlessly in a delicate yet harmonious balance that can only come from authentic Thai cuisine. The complexity of flavors in a single Thai dish alone is impressive, and to experience an elegant 6-course menu delivers the full range and depth of an authentic Thai dining experience. The Asian Food Channel brings the complex and authentic flavors of Thailand with one if its best chefs in a culinary tour dubbed the "Taste of Thailand with Ian Kittichai." An award-winning chef, author, and renowned TV personality of The Asian Food Channel's "3 Chefs 1 City," Chef Pongtawat "Ian Kittichai" Chalermkittichai shares his take on traditional Thai cuisine with a modern twist, featuring his signature dishes from his flagship restaurant ranked No. 31 on 2014's Asia's 50 Best Restaurants, the Issaya Siamese Club. There's nothing quite like dinner high above the city. And 71 floors up, dinner at 71 Gramercy is one of those special places with a bird's eye view of the metro for a unique dinner experience. Chef Carlo Miguel matches the dramatic views of the Makati skyline with his elegant cuisine and hand crafted cocktails at 71 Gramercy. Said to be the highest restaurant and bar in the country, there's really nothing quite like an elegant dinner and a few cocktails 71 floors up. At Size Matters, you have the option to upsize from the usual 1/4 pounder to a hefty 1/2 pound burger, or push your limit from the 6 inch link to a whopping 12 inch sausage link. Ready to go big? Pizza, pasta and good times...with Food Magazine at Project Pie. Food magazine celebrates its 20th Anniversary with a series of free cooking classes for its loyal readers, foodies, and kitchen-savvy people, dubbed simply as "Food Tastings." Tucked away in one of the many residential neighborhoods of Quezon City is Leann's Tea House, one of the area's hidden gems serving comforting home-style Korean cuisine. The flavors are pure and honest, without the usual frills of a major food chain, and with reasonable prices too. Caruso Ristorante Italiano serves up a lavish Italian seafood feast just in time for Lent, from starters to pasta dishes, in a culinary performance using the very best and finest ingredients imported from Italy for a unique dining experience. That first brush with the iconic contour bottle from childhood so many summers ago still linger long after that very first sip, and years later, that memory remains fresh and vivid, forever etched in my mind. That experience is recreated with a perfectly chilled Coca-Cola, with its soothing and intrinsic thirst-quenching qualities delivering that familiar and comforting burn and bite at the back of your throat. Tapenade, a centuries-old Provencal dish made from indigenous produce from the famed Mediterranean region with olives, capers, olive oil, and anchovies, pounded in a traditional mortar and pestle, blend together in a fusion of fresh and vibrant flavors. Aptly named, Restaurant Tapenade brings the bold and sunny flavors of the Mediterranean with classic dishes from Spain, Italy, France, Greece, Turkey, and Morocco in the metro's newest dining hot spot. Go on a leisurely culinary journey of fresh Mediterranean flavors, each elegantly plated with the masterful touch of Executive Chef Luis Chikiamco and his team at Tapenade, one of Discovery Primea's elegant restaurants. ...welcome to The Salad Room, showcasing the very best local and imported produce, hand-picked and carefully selected for a unique and refreshing dining experience. FamilyMart will soon launch its new Health and Wellness Line with its Fresh n'Lite meals, ten healthy, low-calorie, flavorful, and convenient meals created by noted Chef Him Uy de Baron. A premium steak fired up on a grill, sizzling to a fine char as the aroma fills the air...nothing brings out your primordial instincts quite like a slab of beef on a grill. It's the meat of the matter, an innate and visceral link that runs deep inside us, and it all comes back, elegantly, at CRU Steakhouse. Marriott Hotel Manila's elegant CRU Steakhouse offers some of the finest selections of premium steaks and seafood, all perfectly grilled at the centerpiece open kitchen. Le Jardin is the culmination of chefs Jonas Ng and Hasset Go's apprenticeship with renowned French chef Gils Brault of Trois Gourmands, guided by the philosophy of authentic French cuisine made with the finest and freshest ingredients, slow-cooked and made from scratch for rich and rustic flavors. BonChon Chicken introduces its newest flavor, the Crunchy Garlic, to complement its existing line-up of flavors, including its flagship variant, the Soy Garlic, its fiery Sweet and Spicy, and the Honey Citrus. Freshly-Churned Gelato, Everyday...at Bono Artisanal Gelato. Ever since it first served its very first scoop back in December 2012, Bono Artisanal Gelato firmly established its name as the metro's best gelato with its creative and inventive flavors like Speculoos, Cereal and Milk, Bourbon Butterscotch, Taho, and Summer Lavender. And those sleek high-tech gelato mixers at Bono Artisanal Gelato have continuously churned out the very best gelato using the finest local and imported ingredients ever since. Manila Marriott Hotel's Marriott Cafe offers a sumptuous Sunday Brunch Buffet with an impressive spread of Asian, Filipino and continental flavors using the freshest ingredients to complete your weekend. A famous novelist once described wine as "bottled poetry," and for one evening, I gain a deeper understanding on this most elegant, and even sublime, libation made from fermented grapes. Brasserie Cicou and Manila Wine, an online wine store offering an extensive selection of premium French wines with nationwide delivery, collaborate for a special Wine Tasting Workshop paired with a curated menu for an eye-opening and insightful experience. Eight new dishes and four branches in the metro, Torch Restaurant is definitely on a roll, and off to a fiery start for 2015. Refreshing appetizers and salads, comforting pasta and pizza, a classic local favorite, and a massive slab of premium beef of epic proportions, these new dishes are more than enough reasons to visit Torch Restaurant's newest branch at the heart of the Makati CBD. Ramen, katsu, gyoza...the popularity of Japanese cuisine continues to be high on the list of diners, and now another major restaurant chain from Japan will soon enter the local food scene. Ever since Portuguese missionaries introduced their battered deep-fried prawns to Japan in the sixteenth century, the dish has evolved to become truly Japanese, an iconic dish in Japanese cuisine. And leave it to the Japanese to build on a great idea and make it even better. Japan's largest and leading tendon specialty food chain will soon make its debut in the metro with its signature tempura and tendon dishes for another unique and authentic taste of Japan. Eat, learn and enjoy. Experience and discover new flavors and culinary secrets with Food Tastings, a series of four cooking classes presented by Food Magazine and Lifestyle Network. In celebration of Food Magazine's 20th anniversary, special fun-filled cooking classes with the very best chefs will be offered for free to its loyal readers. 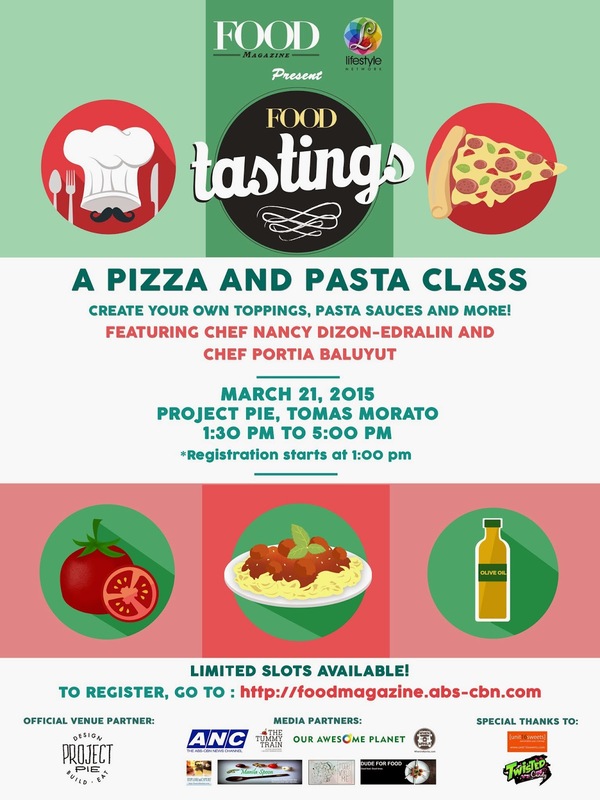 The first class highlights pizza and pasta with noted chefs Nancy Dizon-Edralin and Portia Baluyot scheduled for March 21, 2015 at Project Pie. NutriRite, the newest instant cereal drink that's low-fat yet high in flavor, hits the Philippine market with a splash. And with summer just around the corner, there's no better time than right now to start your day right with NutriRite. Take a flight of premium single malt at the new Rye Tasting Room, a four shot sampler of the best curated selections from Scotland, Japan and the US, and discover the subtle nuances and character of each spirit. A world of flavors using the very best local, single origin, and sustainable ingredients with a view of the lake and volcano...welcome to Taza Fresh Table. Taza Fresh Table is the newest restaurant at Taal Vista Hotel, sourcing the freshest and finest ingredients from local suppliers for its inventive international cuisine. The concept of "source local and cook global" is a recurrent theme at Taza Fresh Table, with fresh, clean and bold flavors in every dish.